Today I’ll show you how to make a homemade Korean rice cake called garaetteok. 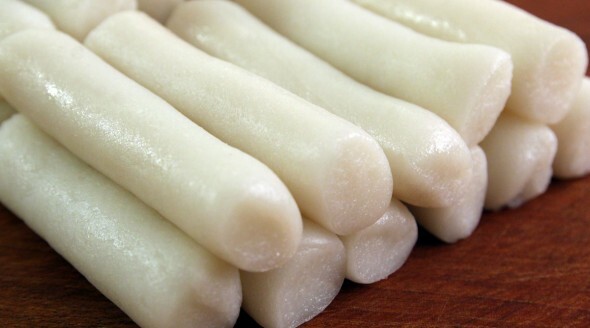 Most of you know what tteok means, right? That’s rice cake. But what about garae? What is it, and what does it have to do with this rice cake? There are a few theories about that. One of them is that garae comes from the verb gaeuda which means “to divide.” Some people think this rice cake got its name because it’s always “divided” into pieces before it’s rolled and stretched. The other theory is the name comes from a Korean farming tool called a garae, which is a type of spade. A garae has 2 thick ropes attached to the side of it so that 2 helpers can pull the ropes and make the digging go faster. Some people think those ropes look a lot like garaetteok, which is how the rice cake got its name. I had never made homemade garaetteok until I developed this recipe for my website, but when I was growing up in Korea, I watched my grandmother in Korea make it once. I remember her pounding the rice cake with her long wooden pestle in her large stone mortar. Kong kong kong! When she was finished pounding it was elastic, chewy, and soft. Then she started rolling out pieces of it with her hands. Rolling and stretching, rolling and stretching, until it became long like a rope. I must have watched her pretty closely because my memories of her working are very vivid! And I also remember her huge smile when she saw me watching her. It was not easy work, and she probably sweat a lot, but she ever frowned. Developing this recipe, I realized how much hard work it must have been for her. I have a microwave to help me, and I am only making a small amount. She made a lot more, and all by hand. Now I really understand how much work it was, and she still had the energy to give me a smile. Several hours after she made it, the rice cake would get a little dry and hard. Then she cut it into thin discs for rice cake soup. I remember that she used to cut it straight across, not diagonally, so each rice cake looked exactly like a coin. I miss her and I miss her smile. She passed away long time ago. You can use a microwave or a steamer to make garaetteok, whichever one you have at home and feel comfortable with. The dough ratio is a little different depending on which method you use, so be sure to use the right one. 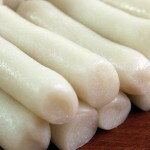 After it’s made, you can cut and prepare it for tteokbokki or tteokguk. Both methods are described below. A note about short grain rice flour: the flour you buy at your local store or the flour you make may have more or less moisture in it than the rice flour I use in this recipe. This is because of many different things like how long it’s been in the freezer in the store, or the atmospheric conditions where you live. 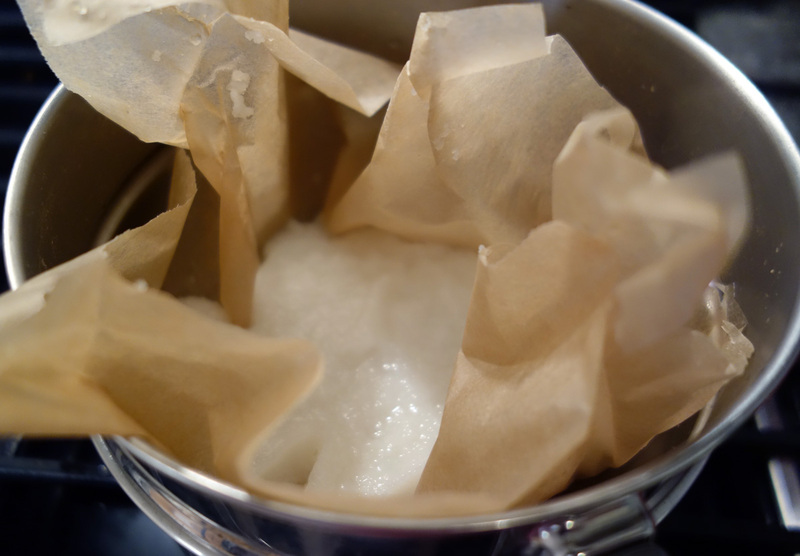 You may need to add more or less boiling water, depending on how dry or wet your short grain rice flour is. Cover it with plastic wrap, leaving a small gap to let the steam release. Microwave for 2 minutes. Mix the rice cake dough with a rice scoop or wooden spoon. Re-cover with the plastic wrap and cook for another 2 minutes. Spread ½ ts sesame oil on your cutting board. Put the hot rice cake in the oily spot on the cutting board. Pound it with a pestle for about 5 minutes, until it becomes smooth and elastic. 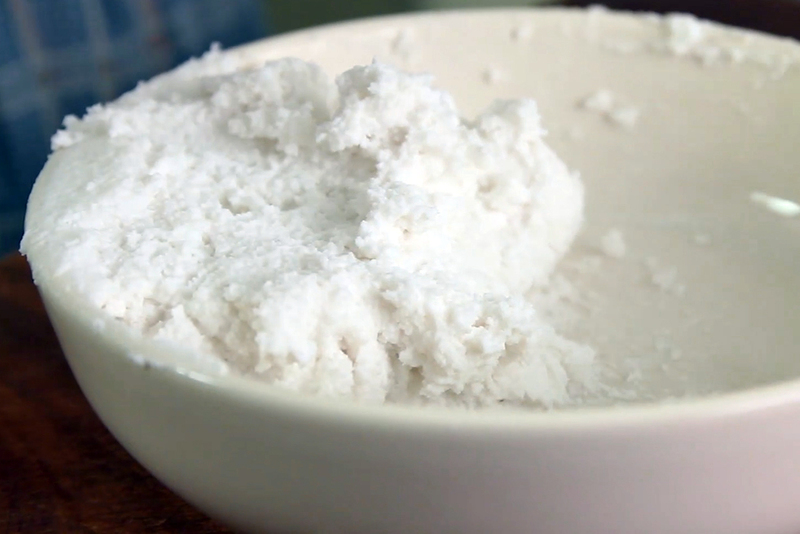 Combine the rice flour, salt, and boiling water in a bowl. Line a steamer rack with parchment paper. Add the rice cake dough and steam for about 25 minutes over hight heat. Spread ½ ts sesame oil on your cutting board. Put the hot rice cake in the oily spot on the cutting board. Pound it with a pestle for about 5 minutes, until it becomes smooth and elastic. The rest of process is the same as the method of using a microwave oven. Cut it into 8 equal pieces, then roll each piece out into a 4 inch long cylinder shaped rice cake. Put ½ ts sesame oil onto your hands and gently rub the rice cakes to coat them in a thin sheen of oil. This will give them a nice flavor and keep them from sticking to each other. 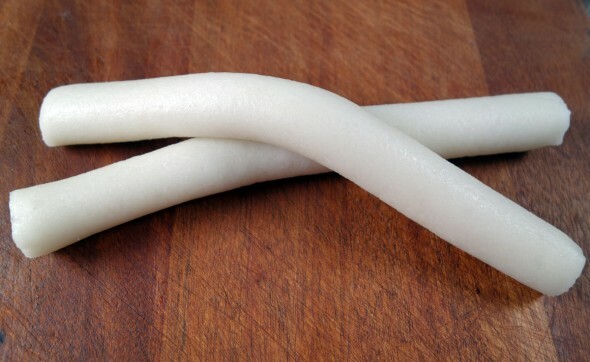 Cut it into 2 equal pieces, then roll each piece out into two 10 inch long cylinder shaped rice cakes. Let them cool at room temperature for several hours, then slice diagonally into thin discs. Use right away, or put in a plastic bag and freeze for later use. This amount is for 1 serving of ddeokguk, so if you want to make two bowls of soup, make two batches. Posted on Thursday, January 17th, 2013 at 5:23 pm. Last updated on August 7, 2017. Posted January 29th, 2019 at 2:54 am | Log in to reply. Hi Maangchi. I went four Korean grocery stores and cannot find frozen rice powder you recommended. They only have rice flour and gluten rice flour, which made in Thailand. Which one should I buy to make rice cake? Posted January 29th, 2019 at 2:57 am | Log in to reply. Posted January 29th, 2019 at 2:58 am | Log in to reply. Posted January 13th, 2019 at 8:10 am | Log in to reply. Maangchi! I live in Indonesia and although there are Korean restaurant here, buying Korean food for takeout can be so pricey, this is also the case for buying ready made tteokboki. I know making the tteok yourself will be so much cheaper , so today i made this recipe using local rice flour, ‘tepung beras’, readily available ingredients here! I steamed the batter and I was worried when i took it off the heat because it crumbles a lot but after some vigorous pounding it came together nicely, the garaetteok is chewy, soft, and fresh! It’s so good! Posted December 1st, 2018 at 9:04 pm | Log in to reply. Posted December 1st, 2018 at 9:06 pm | Log in to reply. Posted December 2nd, 2018 at 9:36 am | Log in to reply. This is medium grain rice. I’ve never used this rice. I would recommend you use short grain rice, which is stickier. Posted August 27th, 2018 at 10:37 pm | Log in to reply. As suggested by the comments, I made do with dry regular rice grain powder and added extra hot water to reach the desired consistency. I microwaved it for 2 minutes and found it too dry / cooked, so I microwaved it for another minute and kept pressing the dough together until there were few creases and rolled them out in small batches, coating my hands in sesame oil. At this point they were still a little raw, so I steamed them in the rice cooker for around 5 – 10 minutes. The consistency was perfect for tteokbokki! Posted July 27th, 2018 at 7:34 pm | Log in to reply. 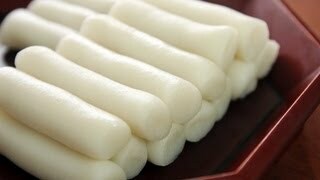 Could I make this with , Mochiko sweet rice flour? I don’t have frozen rice flour and i cant really get it anytime soon, could i used regular long grain rice flour? Posted July 13th, 2018 at 1:32 pm | Log in to reply. Hi Maangchi! I just made this and I realized that I used long grain flour… is this a huge mistake? Have I made a complete fool out of myself? What’s the difference? Posted July 19th, 2018 at 8:21 am | Log in to reply. What do you think of the outcome? Did the rice cake turn out chewy? 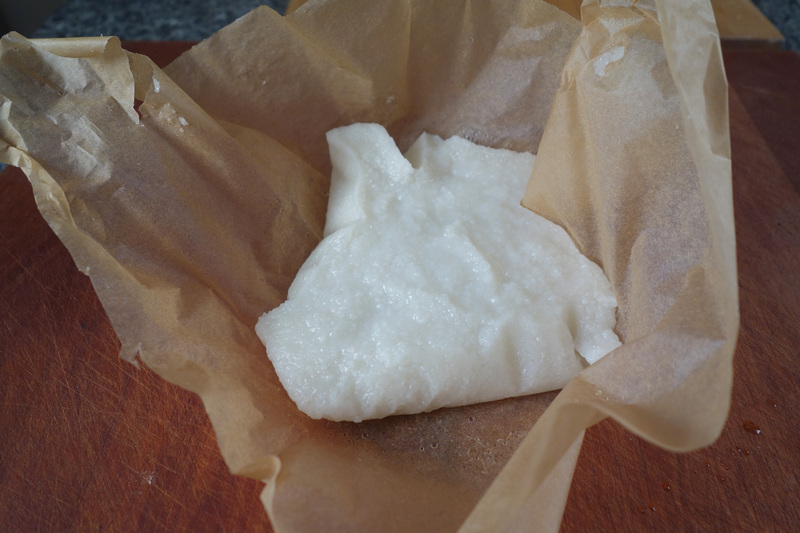 I’ve never made rice cake with long grain rice before, but I heard from a reader a while ago that it will work. Short grain rice is stickier and chewier than long grain rice. Posted July 6th, 2018 at 1:28 am | Log in to reply. i have tried make this, but i didnt steam the batter. i just boiled the batter the result is the garaettok didnt bouncy…. should i steamed the batter? Posted July 4th, 2018 at 10:55 am | Log in to reply. Maangchi, my rice cakes seem fine but the only problem I have is that when I chew it, it is sticky. Is it supposed to be soft and sticky? I am not sure because I have never eaten fresh rice cakes. But compared to the store bought rice cakes, they and harder and more chewy. I don’t know if what I am doing is correct. Can you help me? Posted July 11th, 2018 at 8:48 am | Log in to reply. Yes, rice cake is supposed to be sticky! But to make it more chewy, pound it longer and use a bit less water. Make sure you use the correct rice flour, made with short grain rice (Mepssalgaru 멥쌀가루). Posted June 12th, 2018 at 1:20 pm | Log in to reply. Hi Maangchi! I made these today and they did not turn out like yours. I used the correct flour, water etc. However, I did the flour before measuring. When I added the boiling water, it turned to the consistency of very thick paste. I had to add alot more sweet rice flour in order for it to just stick together enough for me to roll out… Help! Posted July 4th, 2018 at 10:45 am | Log in to reply. Posted June 1st, 2018 at 4:53 pm | Log in to reply. Any ideas what could have caused that? Posted July 4th, 2018 at 10:47 am | Log in to reply. Did you remember to thaw the flour? Was it difficult to shape because it was sticky or because it was not elastic? What did the consistency look like after cooking? Posted May 5th, 2018 at 10:22 pm | Log in to reply. Tried these today. All good until I get to the rolling into cylinders. They don’t keep their shape but revert to a misshapen blob. Was doing it while they were warm. Should I let them get colder first? Appreciate your help. Thanks. Posted July 4th, 2018 at 10:49 am | Log in to reply. So does this mean even when you were pounding them they wouldn’t get flat and is still a blob? This recipe was originally posted on January 17, 2013 at 5:23 pm by Maangchi. It was last updated on August 7, 2017. The video was watched 4,716,967 times on YouTube & has 63,962 likes!